Curb appeal is particularly important when you are trying to attract potential buyers to your home, but also important if you just want to feel proud or good when you walk up to your own home. The front yard says a lot about the home - the grass, the shrubbery, flowers, trees - but a garden and landscaping is a TON of work as we are learning while trying to keep our home's previous owner's garden alive. Your front door is prime real estate for your curb appeal and a lot easier to update and maintain. When we bought our home, it had a cobalt blue front door that brought the house even more charm. Over the years, it's picked up ware like all front doors do and is in need of a fresh coat of paint leading us to our next project - updating the front door and facade. 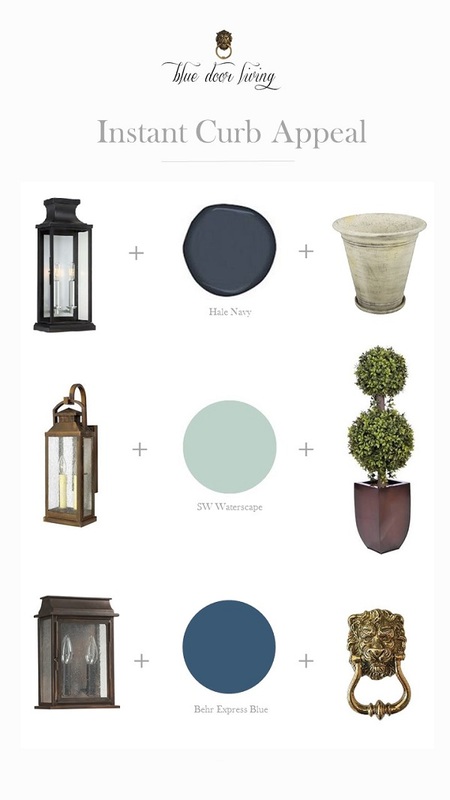 Short term - I'm scouring sites for blue door inspiration + outdoor lanterns, my favorites below. Long term -adding shutters. Most of my favorite blue door inspiration photos are of navy blue doors, but that teal door is pretty charming too. Blue and white is such a classic combination. Here is my most favorite blue door and front facade from BHG. It's absolutely stunning. Other ways to add easy curb appeal in with the lights and hardware on your door. A statement outdoor light or bold hardware goes a long way for the style of your home. Scroll down for some ideas on lanterns, hardware and plants for your front door.